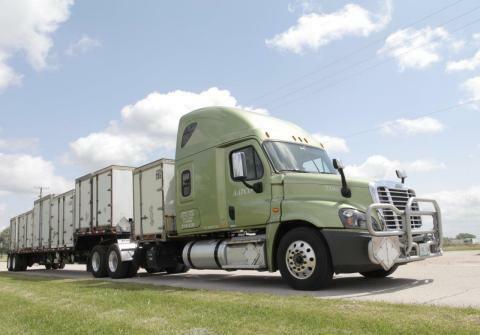 ADDISON, Texas--(BUSINESS WIRE)--Daseke Inc. (NASDAQ: DSKE)(NASDAQ: DSKEW), a leading consolidator and the largest owner of flatbed and specialized transportation solutions in North America, announced a merger with R&R Trucking, a leading specialized transporter of defense and commercial AA&E (arms, ammunition and explosives) cargo. This marks Daseke’s fourth company addition since May 1, 2017. Founded in 1988, R&R Trucking is comprised of three operating companies, R&R Trucking Inc., TNI (USA) Inc. DBA AATCO and NEI Transport LLC. Primarily through the use of team drivers, the R&R Trucking companies move specialty cargo requiring unique training and security clearances. This includes the transport of defense and commercial arms, ammunition and explosives, radioactive cargo and hazardous materials throughout their network of high security terminals. Daseke Inc. is a leading consolidator and the largest owner of flatbed and specialized transportation solutions in North America. Daseke offers comprehensive, best-in-class services to some of the world’s most respected industrial shippers through their experienced people, over 3,800 tractors, over 8,200 flatbed and specialized trailers and more than a million square feet of industrial warehousing space. This news release includes “forward-looking statements” within the meaning of the “safe harbor” provisions of the United States Private Securities Litigation Reform Act of 1995. Forward-looking statements may be identified by words such as “estimate,” “plan,” “project,” “forecast,” “intend,” “expect,” “anticipate,” “believe,” “seek,” “target,” “will” or other similar expressions that predict or indicate future events or trends or that are not statements of historical matters. Such forward-looking statements may include statements relating to the benefits of the R&R Trucking merger (the “Transaction”), our future performance of following the Transaction and expansion plans and opportunities. These forward-looking statements are based on current information and expectations, forecasts and assumptions, and involve a number of judgments, risks and uncertainties. Accordingly, forward-looking statements should not be relied upon as representing our views as of any subsequent date, and we do not undertake any obligation to update forward-looking statements to reflect events or circumstances after the date they were made, whether as a result of new information, future events or otherwise, except as may be required under applicable securities laws. You should not place undue reliance on these forward-looking statements. As a result of a number of known and unknown risks and uncertainties, actual results or performance may be materially different from those expressed or implied by these forward-looking statements. Some factors that could cause actual results to differ include, but are not limited to: (1) the ability to recognize the anticipated benefits of the Transaction, which may be affected by, among other things, competition and our ability to grow and manage growth profitably; (2) changes in applicable laws or regulations; and (3) the possibility that we may be adversely affected by economic, business or competitive factors. For additional information regarding known material factors that could cause our actual results to differ from those expressed in forward-looking statements, please see our filings with the Securities and Exchange Commission (the “SEC”), available at www.sec.gov, including Hennessy Capital Acquisition Corp. II’s definitive Proxy statement dated February 6, 2017, particularly the section “Risk Factors— Risk Factors Relating to Daseke’s Business and Industry,” and Daseke’s Current Report on Form 8-K/A, filed with the SEC on March 16, 2017 and amended on May 4, 2017. Daseke has a long history of, and intends to continue, acquiring strategic and complementary flatbed and specialized trucking companies. Negotiations and discussions with potential prospect companies are an integral part of the Company’s operations. These negotiations and discussions can be in varying stages from infancy to very mature. Therefore, investors should assume the Company is always evaluating, negotiating and performing diligence on potential acquisitions. 1 Based on R&R Trucking’s audited financial statements. 2 Net loss of $0.9 million plus: depreciation and amortization of $5.9 million, interest of $0.5 million, provision for income taxes of $1.2 million and acquisition-related transaction expenses of $0.3 million results in Adjusted EBITDA of $7.0 million. 3 Net loss of $10.1 million plus: depreciation and amortization of $87.8 million, interest of $24.1 million, provision for income taxes of $2.6 million, acquisition-related transaction expenses of $0.9 million, impairment of $2.0 million, withdrawn initial public offering-related expenses of $3.1 million, net losses on sales of defective revenue equipment out of the normal replacement cycle of $0.7 million, impairments related to defective revenue equipment sold out of the normal replacement cycle of $0.2 million and expenses related to the business combination and related transactions of $3.5 million results in Adjusted EBITDA of $114.8 million. Daseke merges with leading specialized transporter of defense and commercial AA&E (arms, ammunition and explosives) cargo, R&R Trucking.